South Beirut has recently become a vibrant leisure destination with a plethora of cafés and restaurants that cater to the young, fashionable, and pious. What effects have these establishments had on the moral norms, spatial practices, and urban experiences of this Lebanese community? From the diverse voices of young Shii Muslims searching for places to hang out, to the Hezbollah officials who want this media-savvy generation to be more politically involved, to the religious leaders worried that Lebanese youth are losing their moral compasses, Leisurely Islam provides a sophisticated and original look at leisure in the Lebanese capital.What makes a café morally appropriate? How do people negotiate morality in relation to different places? And under what circumstances might a pious Muslim go to a café that serves alcohol? 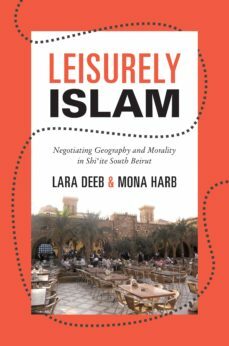 Lara Deeb and Mona Harb highlight tensions and complexities exacerbated by the presence of multiple religious authorities, a fraught sectarian political context, class mobility, and a generation that takes religion for granted but wants to have fun. The authors elucidate the political, economic, religious, and social changes that have taken place since 2000, and examine leisures influence on Lebanese sociopolitical and urban situations.Asserting that morality and geography cannot be fully understood in isolation from one another, Leisurely Islam offers a colorful new understanding of the most powerful community in Lebanon today.